Soulpepper’s first-ever production of a Spanish play, Federico García Lorca’s Blood Wedding (1933), has the misfortune of appearing almost exactly a year after the superb production of the same play by Modern Times Stage Company and Aluna Theatre that won six Dora Awards including Outstanding Production and Outstanding Direction. While the Modern Times/Aluna production combined all the theatre arts to great, unified effect, Soulpepper’s production is misjudged in almost every way, beginning with the new translation by Guillermo Verdecchia and aggravated by poor direction and weak acting. The second problem with transferring the action from rural Spain to rural Ontario is that it fails in its goal. It does not make the play more universal but more specific and it does not make the play more relatable because Southern Ontario does not have a tradition of blood feuds between families as does Spain. The Mother’s explanation of her hatred of the entire Felix family at the start of the play comes off not as a terrifying rift in society but as the petty prejudice of an old woman. So much laughter occurred during the important first scene between the Mother and the Groom that the importance of the entire set-up of the action was lost. The best element of the production is the music played and sung live primarily by Andrew Penner and Anna Atkinson. It is a mixture of Penner’s own compositions and arrangements of other works such as Chris Isaak’s “Wicked Game” (1989). The mistake that director Erin Brandenburg makes is in allowing the music to act as a substitute for the acting in creating the atmosphere for the play. The music should reinforce a mood that the acting has already established. Unfortunately, Brandenburg, who has never directed a classical play before, seems to have little idea how to coax the best performances from her cast. Diane D’Aquila is one of Canada’s finest actors and ought be ideal as the powerful Mother. 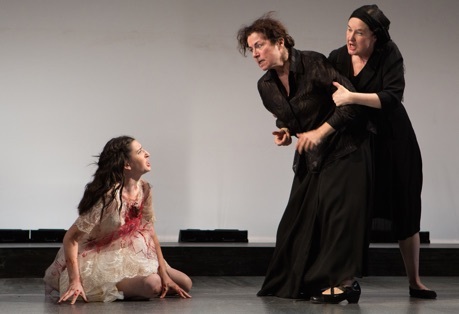 Yet, Brandenburg has her play the Mother, clad in her black Victorian mourning, as if she were an ill-tempered Dowager Countess of Grantham from Downton Abbey rather than an indomitable peasant woman seething with revenge against the family that killed her husband and older son. In a completely puzzling move, Brandenburg also has D’Aquila play the part of the Beggar late in the play who symbolizes death. First of all, D’Aquila heaped in black lace and smoking a cigarette neither looks nor acts like a Beggar. The funny voice she adopts makes her seem more like a cartoon villainess than all mortals’ universal destiny. Second, it is unclear what Brandenburg means by doubling the Mother with Death who is her enemy. By having D’Aquila play both parts, Brandenburg seriously muddies the plays symbolic opposition of life and death. The younger generation most directly involved in the tragedy are insipid. Gordon Hecht gives a Groom who is so nice and obedient that he seems like a milksop. Since the Groom’s first action in the play is to reach for a knife, the actor must show us that beneath the Groom’s placid exterior lies a capacity for rage, otherwise the ending will seem implausible. Colin Palangio plays Leonardo, the Bride’s former lover who is still in love with her despite having a wife and child. This is a character who, as in the Modern Times/Aluna production, should be burning with intensity and sexual appeal. All Palangio manages to communicate is confusion. The same is true of Hailey Gillis in the key role of the Bride. Her complex character should be torn between the urge for momentary passion and the hope for domestic love. Yet, Gillis, too, conveys only an indeterminate confusion so that when she does run away it seems like a surprise rather than an inevitable component of the tragedy. Gillis does come into her own in the great final scene where the Bride confronts the bereaved Mother, but the clarity of her performance then should have existed all through the action. The secondary roles are all well played. Courtney Ch’ng Lancaster is outstanding as Leonardo’s Wife and communicates right from the start both that she knows her husband is visiting the Bride again and that she prays her suspicion is not true. Caroline Gillis plays the Mother’s Neighbour and the Father’s Maid and Deborah Drakeford is Leonardo’s Mother-in-Law. 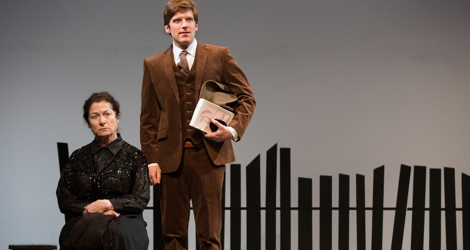 Gillis’s characters provide the only genuine sense of humour in the otherwise doom-laden world of the play. She and Drakeford are expert at giving focus to the younger principals, the only problem being that Gillis and Drakeford are often more expressive than the actors they are listening to. Oliver Dennis is genial as one might expect as the Father but he rises to a surprising level of anger that few of his previous roles have allowed him to attain. The musician Andrew Penner adopts an eerily neutral tone as the Moon who sees and knows all. Using a translation that has moved the tragedy into Southern Ontario has hampered the director in reaching a full vision of the play. It’s clear that she knows the play is a mixture of realism and symbolism but it is also clear that she has not worked out how to make the two aspects work together. In the Modern Times/Aluna production, Soheil Parsa used the sound of hoofbeats whenever characters spoke of or tried to suppress their passion. Except for once when they are used as a naturalistic effect, Brandenburg ignores this symbol that is so embedded in the language. She uses a spotlight raised behind a fringe of strips representing a forest to signify the Moon, but she does not have lighting designer Rebecca Picherak turn down the other stage lights sufficiently so that it makes an impact. Brandenburg also shows no skill in building up the tension inexorably throughout the 90 minutes of intermissionless action. Soheil Parsa had us on the edge of our seats. Brandenburg has us wondering what exactly is happening. Only in the confrontation between the Bride and the Mother does she bring home the tragic nature of the action, but to wait until the final scene to do so is far too late. Anyone who saw the Modern Times/Aluna production last year should feel no compulsion to see the present Soulpepper production. Anyone who chooses to see the Soulpepper production should be warned that it is a very pale representation of one of the great plays of the last century. One has to hope that either Modern Times/Aluna revives their 2015 production or that another company stages a more insightful and exciting production than Soulpepper has. In any case, now that Soulpepper has finally presented a Spanish play, let’s hope that it continues to explore the riches its dramatic literature old and new, Old World and New. Photos: (from top) Diane D’Aquila as Mother and Gordon Hecht as Groom; Hailey Gillis as Bride, Diane D’Aquila as mother and Caroline Gillis as Neighbour. ©2016 Cylla von Tiedemann.